The future of computing comes to Paris this week with the annual Computer Human Interaction (CHI) conference, which showcases new approaches to the way users connect with electronics. Organizers prepare for this year’s Computer Human Interaction conference in Paris. CHI brings together researchers across multiple disciplines from technical to design and engineering with the hope of “cross pollination,” said Patrick Baudisch the technical co-chair at CHI responsible for choosing the research that will be presented. “It’s basically a way for us to digest very large topics by bringing specialists with different backgrounds together,” he said. “We have a mix of computer scientists who are interested in people and social scientists who are interested in technology,” said Wendy Mackay the general chair of CHI. She said interest in the conference has significantly increased over the past few years. In 2012 the conference had about 2,700 attendees and this year it has more than 3,300. One of the big draws at the conference is the “interactivity” section, which is like a mini trade show of futuristic prototypes that attendees can try out for themselves. Gone are the days of just keyboards and mice. “We’re seeing things that go much further into the future,” Baudisch said. Baudisch mentioned one of his group’s projects from the Hasso Plattner Institute near Berlin. The project consists of a user “wired up directly to muscles using electrodes mounted to the human body.” One of his students will be turning the forearms of CHI attendees into input devices that offer force feedback. His group “literally brought a metric ton” of equipment across the border to display at the conference. Baudisch’s team has been the brains behind several big projects at past CHI conferences. The team debuted Nanotouch in 2009, which added backside touch to touchscreen devices like cellphones. While he said it’s just a coincidence, Sony products like the PSP and new PS4 controller use very similar technology. Some projects have seemed more like science fiction. For example, in 2012 researchers from Meiji University in Japan changed the taste of food by adding electricity to it. Their reasoning was that electricity could mimic the taste of salt and by adding electricity to certain foods, people could decrease their salt intake. The electricity diet has yet to go mainstream. 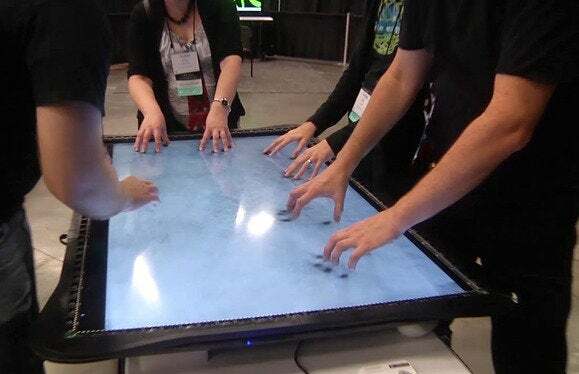 Zerotouch—which turned a 55-inch television into an inexpensive touch interface—was a hit at the 2011 Computer Human Interaction conference. Other groups have taken a novel approach to more complex technology. In a project called Zerotouch that first debuted in 2011, students from the Interface Ecology Lab at Texas A&M University lined the edge of a 55-inch television with infrared sensors, turning the entire display into an inexpensive touch interface. CHI runs until Thursday in Paris.